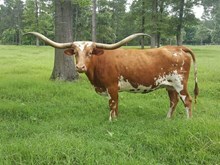 Here is a nice cow out of a twisty horn producing cow family. She calf at side sired by our Cowboy Tuff son Tuff and Ready. Consigned to the Deep in the Heart of Texas Sale. Sells with the bull calf at side. Her maternal sister sold for $40k in 2015.